Celebrating 48 years in Business! New Artist Trading Cards are Here! Supplies include nearly 300 of Jean Hansen’s Original Theorem Designs that are sold in kit form. With more than 48 years of experience in roles varying from student to teacher, designer retailer and distributor, Jean Hansen of Jean Hansen Publications has the experience and dedication required to run a successful online art supplies shop. 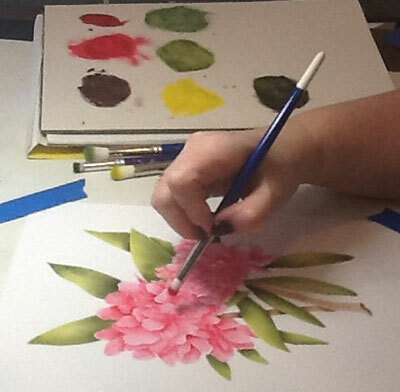 Jean Hansen Publications offers several All Day Workshops each month and one to two day retreats for stencil and quilting enthusiasts alike. Jean’s classes encompass several aspects of fine art including decorative painting techniques, ranging from Theorem stenciling to the new miniature size artist trading cards, to stenciled quilt workshops for all skill level quilters. Jean Hansen Publications is a supplier of a total line of Theorem Stenciling Supplies offering designer stencils, stencil designs, stencil brushes, stencil paint and all necessary art supplies and materials for the Decorative Painter, Stenciler, Stamper, Quilter, and Crafter. Come see why so many other art enthusiasts have turned to Jean Hansen Publications for their designer stencils, stencil brushes, paint and so much more. Browse through any of our products located on the left hand side of the page and purchase directly through our online shopping cart or sign up for a workshop today! We thank you for taking the time to stop by and check out our online store. If you have questions about any of our products or services, feel free to call us at 603-986-6646 and we would be more than happy to answer your questions. You can also contact us by email simply by filling out the contact us form located here. We look forward to working with you and serving as your new go to source for designer stencils, supplies and art knowledge! Receive special offers and first notification when new products become available!